Please Note: A booklet copy of this User Guide is provided with each Vacuum Mount purchace. Clean the mounting surface and the face of the vacuum cup, if needed (see SeaSucker Maintenance). Apply moisture to the sealing edge of your SeaSucker. CAUTION - test your SeaSucker to see if it deforms surfaces with soft coatings. Position the cup so the red line will be visible if your SeaSucker loses vacuum while in use. Pump the plunger until the cup attaches completely to the mounting surface and the red line is hidden in the pump’s cylinder. Check the plunger frequently to make sure the vacuum cup remains securely attached. If the red line appears, pump the plunger again. See WARNINGS for more information. Pull one of the release tabs until the vacuum cup loses vacuum pressure and releases from the mounting surface. Clean your SeaSucker with fresh water after each use in a saltwater environment. See SeaSucker Maintenance for more information. For maximum longevity, do not store your SeaSucker in the sun when not in use. Failure to heed these warnings could damage your SeaSucker or the load, or injure the user. Load capacity is calculated for SeaSucker’s attached to the upper side of the horizontally orientated static surfaces. Any leverage generated by lifting vertically orientated loads or by attaching equipment on SeaSucker’s will reduce the effective capacity. Do not use your SeaSucker to support a person or loads that exceed its load capacity. Do not support loads that could cause injury if your SeaSucker disengages unexpectedly. Do not place your SeaSucker on surfaces that could damage the sealing edge of the vacuum cup. Avoid conditions that could cause your SeaSucker to slip or to disengage prematurely; such as contaminants, cuts or scratches in the mounting surface, applying your SeaSucker to porous materials, applying pressure against the cup edge or leaving your SeaSucker engaged for more than 24 hours without releasing the vacuum. Do not use your SeaSucker when the orange band is visible. If the orange band reappears frequently, discontinue use and refer to the SeaSucker Maintenance and SeaSucker Troubleshooting Guide. Do not allow anything to interfere with the free movement of the plunger while in use. Avoid touching the release tabs while your SeaSucker is in use. Monitor your SeaSucker while in use. Do not use solvents or other harsh chemicals to clean the vacuum cup. For best performance, inspect your SeaSucker regularly. Examine the pump for cracks or other damage. Examine the vacuum cup for cracks, cuts or roughness around the sealing edge. Check vacuum cup for stiffness, dryness or cracks. 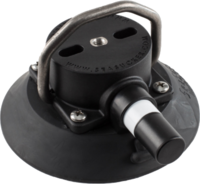 Ensure that the screws holding the pump housing to the vacuum cup and any screws attaching accessories to your SeaSucker are securely tightened. If your SeaSucker does not function properly, check the SeaSucker Troubleshooting Guide below for suggestions on improving performance. Periodically clean the face of the vacuum cup with a sponge or soft cloth, dish soap and water. Do not use solvents or abrasive cleaning pads. Clean your SeaSucker with fresh water after each use in a saltwater environment. If the pump feels sluggish or obstructed, pull the plunger straight out of the pump and clean any dirt or salt residue out of the inside of the pump. Clean off the plunger’s black rubber gasket and lubricate the gasket with silicone gel. Do not use petroleum-based lubricants on the gasket. Insert plunger back into the pump cylinder and push in until seated normally. If the pump gets wet or fills with water, remove the plunger and drain the pump cylinder, clean out and let dry before reinserting the plunger. For lighter loads, you can attach accessories to your SeaSucker by screwing into the ¼-20 insert on top of the housing. For more substantial loads; remove the four screws at corners of the housing, remove the housing from the cup, and pump assembly. Attach your accessory by bolting it onto the housing through the two slotted holes in the top of the housing. Secure the bolts with nuts from the back of the housing. Replace the housing onto the pump and cup assembly and tighten the four housing screws at the corners. If the pump comes apart from the vacuum cup, wet the tip of the pump and reinsert it into the receiving hole by gently twisting the pump while pushing it back into the hole. These ratings include a 3:1 safety factor and assume: (1) attachment to a clean, smooth, nonporous flat surface; (2) a minimum vacuum level of 17.5” Hg (-59KPa): and (3) a friction coefficient of 1. See WARNINGS above for more information. Use your SeaSucker on clean, relatively smooth, nonporous surfaces, at temperatures between 00 and 1200 F. Contaminants can cause your SeaSucker to slip or loose vacuum pressure. The orange band indicator might not perform reliably at elevations above 5000 feet. Dry surface or mounting cup. Apply moisture to the mounting surface or the sealing edge of the vacuum cup. Nicks or cuts on edge of vacuum cup. Clean the plunger assembly and inside of the pump cylinder. Apply a light coating of silicone lubricant to the gasket. Dirty or uneven mounting surface. Clean the mounting surface, move your SeaSucker to a smooth, clean, flat surface, or apply moisture to the mounting surface or the sealing edge of the vacuum cup. Clean the mounting surface or move your SeaSucker to a smooth, clean, flat surface. Clogged or obstructed valve stem. Clean the plunger assembly and the inside of the pump cylinder. Gear Campus offers a 1 year, non-transferable warranty covering defects in materials and workmanship. Defective products can be returned within 1 year of the date of original purchase to Gear Campus for replacement or repair (at Gear Campus's discretion). A sales receipt must accompany warranty claims. The cost of postage to and from SeaSucker for the repair or replacement of any defective part or accessory is not covered by this warranty and is to be paid by the owner. This warranty does not apply to damage or failure resulting from normal use, routine wear and tear, lack of maintenance, user error, alteration of this product, accidents, abuse or neglect. This warranty is given in lieu of all other written and oral warranties, express or implied, including without limitation implied warranties of merchantability and fitness for a particular purpose, and is limited to the duration and specifications of this warranty. SeaSucker’s liability for any damages relating to any allegedly defective product, whether arising from the use or the inability to use the product and whether claimed under tort, contract or any other legal theory, shall be limited to the actual price paid for such product shall in no event include loss of use, loss of time, incidental, consequential, special or indirect damages of any kind, even if SeaSucker is aware of the possibility of such damages, to the full extent as such may be disclaimed by law. Please refer to the Gear Campus Product Returns Policy for more information. SeaSucker: Warranty Return Level 2, 123 Bernard Street Cheltenham VIC 3192. Gear Campus will allow you to return unused products, as long as the product is in ‘as new’ condition and in its original packaging, for exchange or refund within 30 days of purchase and is accompanied with a copy of the sales receipt. Copyright © 2019 Gear Campus Pty. Ltd.